The favorite relay race for one family involves only paper plates, whipped cream, and ’Nilla wafers (cookies). The family divides into teams and each person must run to the end and try to pick up a cookie from the plate on the ground without using their hands. The fun part is that the cookie is COVERED with whipped cream! The kids love to watch us make fools of ourselves! 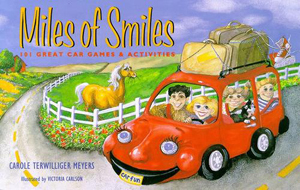 In a Parents magazine article, Eileen Ogintz included a sidebar called Breaking the Ice which included the following suggestions for games: a scavenger hunt, a family Olympics, a volleyball or kickball tournament, an arts-and-crafts table with lots of supplies, face painting, ice cream making, bingo and bubbles. Ask everyone to send photocopies of baby pictures of each family member. Mount and number each picture on a large presentation board. Give each player a piece of paper numbered to match the number of pictures. Each player writes baby’s names that match the numbers. Since most families are somewhat familiar with their own baby pictures, the surprises are often in spouse’s baby pictures. Two relay teams walking with half dollars between their knees to deposit it in a coffee can and tag the next contestant. Pass the toilet tissue and tell everyone to “take as much as you need.” After everyone has torn off a quantity, see who had the closest amount to fit around their waists. Or ask everyone to tell as many facts about themselves as they have squares. See who can eat four saltine crackers and be the first to whistle. Blindfolded wives identify their husbands by feeling the men’s bare feet. Family Talk and Grandparent Talk facilitate conversation in a fun and relaxed manner.The question cards fit a wide age range and any type of family. Our families learned new things about each other in a short period of time. The tin makes the game easy to play at the dinner table or outside at the picnic table. The carabiner set takes the already portable game to even more destinations. The carabiner set fits easily in a backpack or picnic basket for on-the-go conversation. There is no worry that the cards will be lost or damaged. Family Talk and Grandparent Talk enlivens any family conversation, anywhere. Carousel Press provides this map for you and your kids to color along the way. Print a second copy to color where you’ve been to reveal where you still need to go. Alphabet Game — One person chooses a category (animals, cities, famous people) and starts with an example. The next player says a word that begins with the last letter and so on until someone is stumped and must drop out. The game continues until only one player, the winner, is left. Guessing and Giggles — This is both fun and funny. Taking turns, the player reads a sign, dropping the first letter of each word as in “_alling _ocks _head.” After giggling at the funny message, the one who guesses correctly (“falling rocks ahead”) wins. Rhyming Sentences — Work your way through the alphabet by creating sentences that rhyme such as “Alice sees a palace,” or “Bill took a pill.” In additional rounds, choose subjects or the number of words in the sentence. Laugh Attack — This is a fun way to practice your acting abilities! The player who is “it” must answer questions with the word bananas and may not laugh! The others ask questions that are ridiculous when answered this way. “What do you use to brush your teeth?” or “What is your favorite subject in school?” The round is over when the rules are broken. Then, the next player gets a chance to keep a straight face. Choose different reply words. 20 Questions — One person thinks of a person, place or thing. Children and parents singly or in teams ask yes/no questions. Whoever guesses correctly wins. After 20 questions, if no one has guessed, then the person with the word is declared winner. When packing games to bring to your reunion think about bringing a variety for different situations: to play alone, to play with a parent or sibling, or to play in a group. Also bring books and music. And remember the old stand-bys of paper and pencil, crayons, coloring books, craft paper and bedtime storybooks. Avoid toys with lots of small parts that can get lost but do bring ones with multiple uses like playing cards. From Smugglers Notch Resort’s Guide to Planning the Perfect Winter Family Vacation. For a copy of the guide, call 800-451-8752; smuggs@smuggs.com. Used with permission. B. Smith, in her lavish book, B. Smith: Rituals & Celebrations, (1999, 241 pages, hardbound. Random House, New York NY) talks about her family’s games: “My family’s Saturday afternoon outdoor games event was a huge success, because it gave everybody the freedom to be totally silly. There are lots of laughs to be had when a group of people of different sizes and shapes get together to play games like horseshoes, softball, tug-of-war, relay races, or steal the bacon.” In case the weather doesn’t go along with your plans, have equipment ready for indoor games – bingo, cards, and board games – and arts and crafts for the children. Plan ahead and ask everyone, in pre-reunion correspondence, to bring a gift-wrapped item for a white elephant sale. White elephant items are usually those no one wants, too tacky for words, or simply not the taste of the giver. At random, give each member a number, which becomes the order in which members can pick a white elephant. The first person unwraps and waits for the second person (with whom the first person might exchange … or not). The exchanging can continue as people open packages, but no item can be swapped or exchanged more than three times, so the person who ends up with a third trade keeps that item and is finished in the game. If the Davis County (Iowa) Old Soldiers and Settlers Reunion teaches anything, it’s that kids don’t change. Games played during their reunion are sack races, three-legged races, hoop races and other events that would probably have been recognizable to children in 1846, when Drakeville, Iowa, was founded. There was fishing, a makeshift duck pond, and a mad scramble for candy hidden in hay (a more savory version of the needle in the haystack) for the younger children. An egg race and balloon toss entertained older ones. The wheelbarrow race—where kids pair up and A holds B’s ankles while B scrambles on his hands—was for children ages seven and eight. Kids lined up for the egg race. Each contestant clenched a plastic spoon in his mouth. Organizers gave each an egg, which had to stay in the spoon during the race. The number of drops and falls quickly suggested that the eggs were hard-boiled. There was still a frog jump, canoe carnival, mule show and several other events to go. The youngest folks at the reunion were on the main stage in the baby contest. From an article by Matt Milner in the Ottumwa Courier, Ottumwa, Iowa. 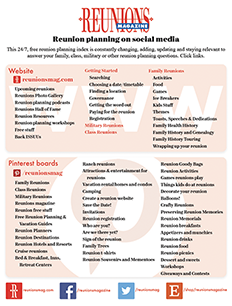 Our online survey (www.reunionsmag.com) asks where your “dream reunion” would be (money is no object). Theme parks consistently score very high and Walt Disney World (WDW) is at the top of the list. 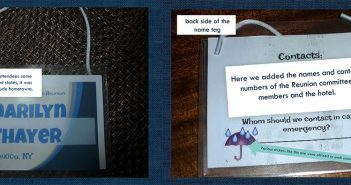 Scavenger hunts for “Hidden Mickeys” in WDW is a new group activity, with clues, hints and points. Hidden Mickeys are images of Mickey Mouse that Disney’s designers have camouflaged all around WDW – in rides, on walls, even in walkways and fences. Disney fanatic Steve Barrett, who has visited WDW almost weekly for over a decade, wrote Hidden Mickeys: A Field Guide to Walt Disney World’s Best Kept Secrets. There’s a scavenger hunt for each park, one for the resort hotels and one for everything else in the “World” … almost 500 hidden Mickeys. To add to the fun, Barrett assigned point values of one to four for each Hidden Mickey you find. The harder to spot, the higher the score. Young children can focus on easy-to-spot one- and two-point Mickeys, while teens and adults will especially enjoy finding the better camouflaged three- and four-pointers. Hidden Mickeys: A Field Guide to Walt Disney World’s Best Kept Secrets, 2nd edition by Steve Barrett (2005, 173 pages; $11.95. The Intrepid Traveler, PO Box 531, Branford CT 06405; www.TheOtherOrlando.com). Maria Moore, Fredericksburg, Virginia, helps plan the Moore, Swensson/Mattsson and Ferro Family Reunions andHayward Cousins Crusade. For a recent Moore Family Reunion she made a match game. The first card has pictures of family members now and as youngsters. Their matches are on the second card. Spilsbury’s newest collection is perfect for kids and adults who like to keep playing after the sun goes down! 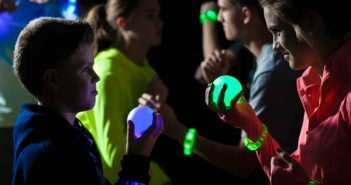 They came up with light-up versions of favorite games families can keep playing after dark. Spilsbury’s Collection includes Light-Up Bocce Ball, Football, Soccer, Basketball, Volleyball, Horseshoes and Croquet. All light-up games are sturdy enough for years of outdoor nighttime fun.